I’m so pleased to announce that version 2 of PicoCool has launched! 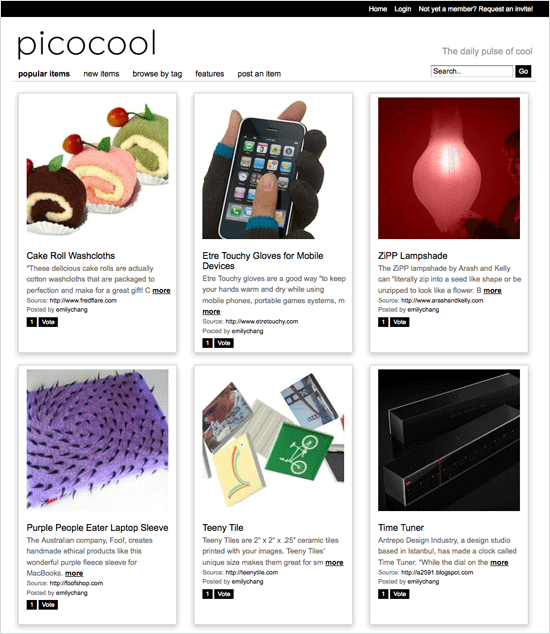 I originally started PicoCool in September 2007 as a side blog where I could indulge in my passion for finding unique, and often obscure bytes of content from social networks and peer media. After doing that for a little over a year, I really wanted to open the site up to the community. Rather than being a blog where I post my finds, PicoCool is now a global community dedicated to uncovering “the cool.” As a member, you can contribute your own discoveries within art, architecture, design, culture, environment and science, technology, fashion, travel, and lifestyles. You can also vote on items, “friend” other members, and post comments. While PicoCool is invite-only, you can join us by simply requesting an invite. Please contact me if you have any questions, comments, ideas or opportunities. I’d love to hear from you. This is just the beginning of a whole new PicoCool. Stay tuned for updates! I think it is a beautiful site with a lot of potential. When it really becomes a community, the site will promote itself. I love the new version!! It has been a couple of months since I visited your website. But Emily, you did a great job with that design, and it still carries the beautiful simplicity it always had.